... 1860 (150 years ago today), in Savannah, Georgia, a daughter was born to a Chicago native and her husband, an officer in the Confederate Army. They named the girl Juliette Magill Kinzie Gordon, but called her "Daisy." Following schooling in Virginia and New York, she traveled in the United States and Europe, eventually marrying an Englishman and thereafter was known as Juliette Gordon Low (right). She returned to the United States to serve as a nurse during the Spanish-American War; her husband died soon after. 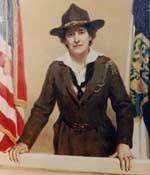 On March 12, 1912, at age 52, she brought together 18 girls in Savannah, and thus founded the Girl Scouts, an organization now numbering 3.7 million members. Gordon Low died in her birth city in 1927.